Virtual teams have tremendous opportunities despite their great managerial challenges. Key drivers of performance are certain crucial team processes that, for example, help coordinate work and facilitate communication among members. Socio-emotional: Increase the cohesion of the group, commit to the overall group goals, identify with the team, actively support the team spirit. The overall effect of dispersion depends on the quality of the team’s task-related processes. 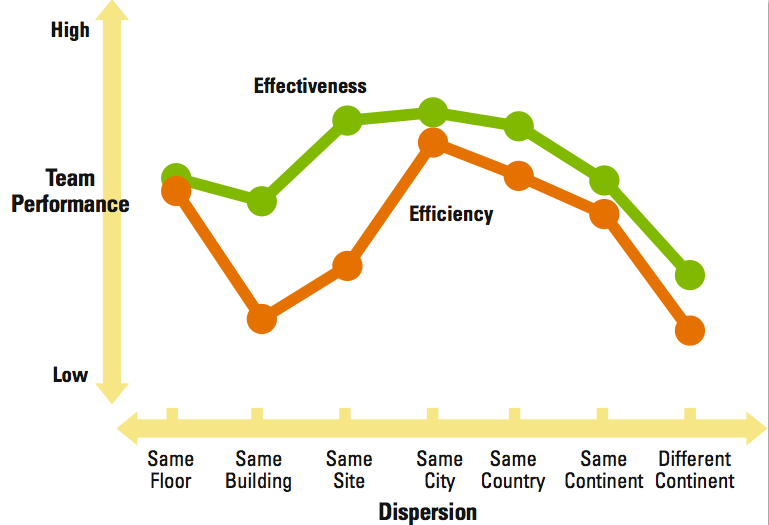 Don’t underestimate the significance of small distances: Effectiveness (quality of team output) and efficiency (time and cost) were noticeably lower with people located in the same building but on different floors. Team leaders easily underestimate the barriers to collaboration – they regularly underestimate the significance of small distances. Emphasize teamwork skills: Don’t do the mistake of staffing on the basis of people expertise and availability but consider social skills (a major prerequisite for good teamwork). Promote self-leadership across the team: Ensure the dispersed teams broad-based leadership capability. This highlights the need for people to be more self-sufficient and how they manage their own work because the team leader is less in a position to help. Provide for face-to-face meetings: Face-to-face meetings are effective for initiating and maintaining key social processes that will encourage informal communication, team identification, and cohesion > Project kick off meeting. The expenses necessary can lead to large returns if the virtual team is able to take full advantage of its diverse expertise heterogeneity. Foster a “global culture”: Global mindset in which people see themselves as part of an international network is helpful, e.g. 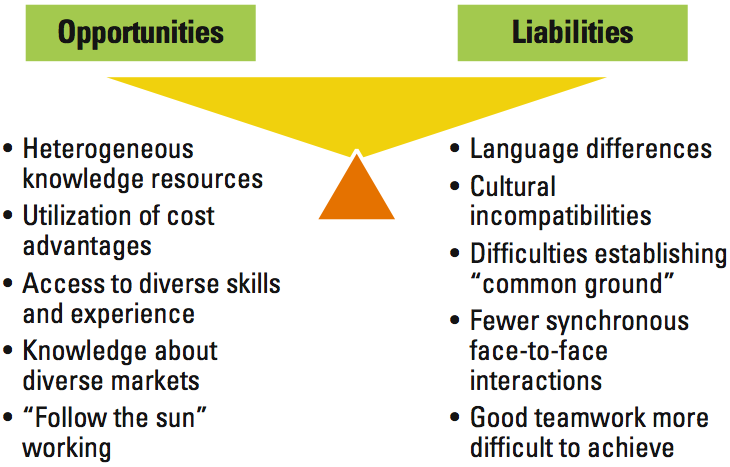 move every 4 years to another subsidiary: Advances the development of diversity-friendly attitudes and the ability to work in different contexts, which in turn helps employees to cope with the challenges of distance when working on virtual teams. The performance of teams suffer with increasing level dispersion. Companies can take advantage of the diversity and varied expertise of team members at different locations. A company can’t just assembly dispersed team top-notch talent and hope for the best > It needs to ensure that the necessary socio-emotional and task related processes are in place.